The owners of a rural residential block say its value has dropped $65,000 as a result of their neighbours getting permission to run an industrial operation. “Who will compensate us for that loss caused by a Territory government decision?” asks Ross Copland who with his wife, Angela, fought tooth and nail to stop the running of a plumbing business next-door to their land, in Petrick Road. The application was opposed by 37 objectors – mostly rural residents – and only five were in favour. It seems nearly all of the supporters – nearby residents – will now also cop a drop in the value of their land. Yet the Development Consent Authority (DCA), which has five local members and a Darwin-based chairman, decided in favour, and the Lands Minister Dave Tollner signed off on it. A similar situation is now brewing in the Ilparpa area, and there are dozens of rural blocks where uses brazenly in contravention of regulations are taking place. However, the Department of Lands disclosed two days ago that it “does not have legal powers to prosecute under the Planning Act. The DCA has those powers and will be considering the [Ilparpa] matter and appropriate action in a closed session of the meeting”. The reconsideration of the valuation of the Coplands’ block took place at their request. They had argued all along that the use of the block next-door would depress real estate values in their neighbourhood. They were told this month by the Valuer-General, John Love, that the “unimproved capital value” of their two-hectare block is now $300,000. Mr Love had appointed an independent valuer and took his advice. The Darwin-based contract valuer had reported that the Coplands claim they are “now located in Industrial zone even though Devt. [the development] is approved under RL zone”. He writes that there is “evidence that shed on adjoining block detracts on the underlying land value of the subject block. In fact Mr Love slashed the value by more than 20%. Objectors had argued that the application was in contravention of the government’s Planning Scheme which defines home based contracting as “the storage on the site of a dwelling of materials and/or vehicles associated with a business operated by a person resident in the dwelling, but which business does not operate from the site of the dwelling”. But operating the business from that site was exactly what had been applied for, and this is exactly what was approved. 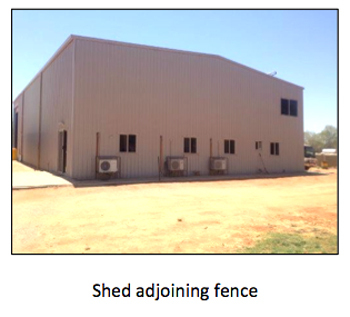 PHOTO: “That shed” featured in the controversial development application, as pictured in the valuer’s report. DECLARATION OF INTEREST: The writer is a resident in the neighbourhood which is the subject of this report. This is again the tip of the problem. There is no incentive for people wanting industrial land to locate to where the original industrial land was designated to be. Rural land is certainly cheaper than industrial land in town but there is no incentive to move to Brewer, in spite of the original consultants to Kilgariff pointing out that development follows the rail way line. There were several ways in which the Government could and should have encouraged this movement. Brewer is closer to the amenities, power and water and potential employment and therefore surely concessions in these facilities was an obvious method of encouraging development out there. Kilgariff housing should have also been out there to alleviate travelling time. No one has shown any figure work on how many people travel to work south of the airport daily and how far they travel. This would enable what is now Kilgariff (ASRI) to do what it was originally set up to do – i.e. to show passers by, many of whom are potential investors here, what we are all about. That is now all about producing food, and the really sad part is that many of the facilities at the rear of AZRI buildings are a sad testimonial to the priorities of Government. There is a car wrecking yard not far from where we live on Heffernan. It was put there in stealth and never condoned, or approved. I often wonder at the size of the rucus had that been re located from Ghan Road to Lindsay Ave, or a dog boarding kennel set up on Bloomfield Street. Yet we rural residents are expected to simply turn away saying that’s progress. It’s time to call a halt to industrialization of the rural areas and provide incentives for proposed new industries to set up in the areas provided for and designed them i.e. Brewer. Another very short sighted move by Government. Bad for residential values but also bad for commercial land value. Why pay a fortune for industrial land in town when you can buy far cheaper residential land? There is no industrial development near me, but my land also has lost its value from $245,000 to $225,000. Not a bad devaluation for a town block. Please have a look at the complaining neighbour’s property. Once it was a nice neat property but have a look at now and make up your own mind. Whilst I feel for the owners of the property, if the correct process has been followed, then we need to abide by the umpire’s decision. Our neighbours all affect our property values, but that isn’t something we can control. For example, if anyone came to view my home on a weekend or after 3pm in the afternoon, I couldn’t give the place away due to the noise from next door. I’m sure one of those kids is going to be a professional whinger when he grows up.